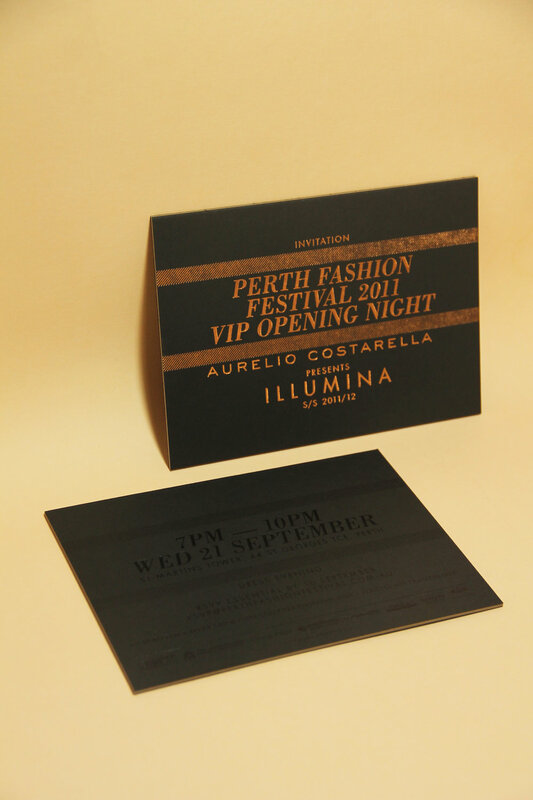 A luxury printed invitation sent out to all VIPs for the opening of Perth Fashion Festival in 2011. The client required a visually-stunning and high-end printed invitation, that would really appeal to the elite VIP guests of the opening night of PFF, Western Australia’s premiere annual fashion festival. The invitation needed to have ‘wow factor’, with a modern style and a fashion-inspired design. ROAM created angled linework to look like stitching and combined it with carefully selected elegant, fashion-magazine-inspired typography, for a simple yet sophisticated design for this invitation. The print techniques were vital to the success of the end result — copper foiling and black foiling, on uncoated black card, triplexed with a thick sheet of boxboard in the centre. It required ROAM to use experience and knowledge of unusual, luxury print techniques, to create a high-end yet edgy printed result with serious ‘wow factor’.